Minnesota is home to over 40 different Asian Pacific Minnesotan immigrant and refugee communities. Each community has its own strengths and challenges that may be unique to that ethnic community. The following is an overview of how Chinese and Taiwanese community is faring in Minnesota. The Chinese Americans are among the earliest AAPIs who settled in Minnesota. Arriving alongside other pioneers, mostly of European descent, Chinese immigrants built their businesses and grew their community in the state starting in the mid-18th century. In the last decade alone, the Chinese and Taiwanese population grew 54.5 percent in Minnesota – much of the growth stemming from the need for highly skilled workers and the rise of Chinese and Taiwanese students seeking educational opportunities in the state’s universities and colleges.ii Although the community is only the third largest AAPI ethnic group in Minnesota, Chinese Americans continue to be the largest AAPI group in the U.S. with an average age of 45 years old.i APA ComMNet REACH CORE project staff and volunteers met with Chinese and Taiwanese American community members and leaders throughout the Twin Cities to understand the community’s strengths, challenges and other social and environmental factors affecting its overall health and wellbeing. Chinese and Taiwanese community members who participated in this project identified the lack of adequate transportation, access to affordable health care, and the limited proficiency in English of some of its members as barriers to the community’s overall health and wellbeing. With over 42 percent of the Chinese and Taiwanese population in Minnesota considered to not be proficient in English, many community members indicated that Chinese and Taiwanese Americans, particularly the elderly in the community, are unable to access appropriate care. 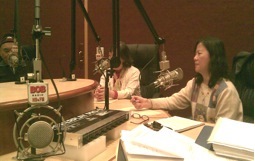 As a guest during the Chinese and Taiwanese radio show concluded, “[We need] easy access to clinic, overcome language barrier by attending ESL classes. Not enough classes to offer senior, need more people involve and support.” Chinese and Taiwanese community members also stated that younger members seem to neglect taking care of their elderly, which is customary in traditional Chinese and Taiwanese culture. However, with many Chinese and Taiwanese Americans growing up in a society that typically employs professional help to care for their elders, younger Chinese and Taiwanese Americans’ behavior to not care for their elders in a traditional manner has affected the health of the community as a whole. In addition, APA ComMNet survey results show that although smoking rates in the Chinese and Taiwanese American community was found to be relatively low (figure 3). Chinese and Taiwanese community members who participated in this project stated that a high number of Chinese restaurant workers smoke cigarettes, with some stating that the smoking rate of this particular population is up to 75 percent. Host Peiju: Chinese ancient idea about “Take care all the elders like take care our own parents”, share the great love to improve our community’s health. Guest Shi: lack of information, do not know where to start. 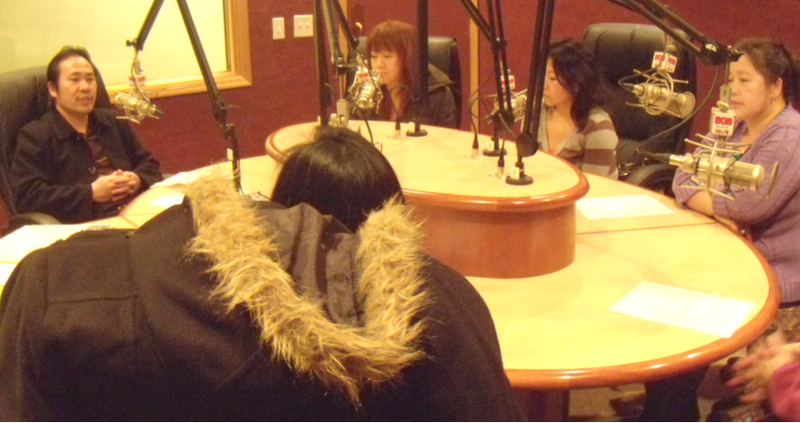 Guest Li: Most of my time in CSSC is volunteering. We need to reach out to our neighbors and to our seniors. They need activities and the opportunity to get together. 2-3 days a week will be appropriate. Council of Asian-Pacific Minnesotans (CAPMN), 2012. 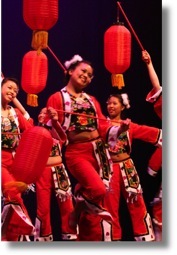 The State of Asian Pacific Minnesotans: 2010 Census and 2008-2010 American Community Survey Report. St. Paul, MN. Published by the Council of Asian Pacific Minnesotans. Tafarrodi, Niccu. NorthPoint Health and Wellness Center Community Assessment Report – A Brief Qualitative Assessment of Five Ethnic Communities: Cambodian, Chinese, Hmong, Lao and Vietnamese. Minneapolis, MN. 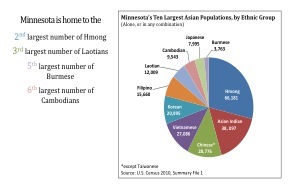 According to the 2010 U.S. Census the eighth largest Asian American populations in Minnesota are the Hmong, Asian Indian, Chinese, Vietnamese, Korean, Filipino, Laotian, and Cambodian communities. Specifically, 27 percent of the total population identify themselves as Hmong, 15.5 percent are Asian Indian, 11.7 percent are Chinese, 11.1 percent are Vietnamese, 4.9 percent are Laotians, and 3.9 percent are Cambodians (Figure 2). Minnesota is home to over 40 different Asian Pacific Minnesotan immigrant and refugee communities. Each community has its own strengths and challenges that may be unique to that ethnic community. The following is an overview of how the Hmong American community is faring in Minnesota. The Hmong American community is the largest AAPI ethnic community in Minnesota and is second to California which has the largest Hmong American population in the U.S.1 APA ComMNet was able to survey a larger number of respondents from the Hmong American community – almost three times more than any other ethnic AAPI groups compared to other AAPI groups. . APA ComMNet REACH CORE project staff and volunteers met with Hmong American community members and leaders throughout the Twin Cities to understand the community’s strengths, challenges and other social and environmental factors affecting its overall health and wellbeing. In general, the Hmong American community perceived its quality of life in the Twin Cities as fair or improving. Hmong Americans stated that they are healthier living here in the U.S. compared to their relatives in Thailand, Laos and other areas of Southeast Asia. Several Hmong community members indicated that ample activities and opportunities exist for youth to be physically fit, reach their academic goals, and live to their fullest potential. Numerous participants also expressed that Hmong American youth of today hold more degrees in higher education and are expected to live longer compared to their parents’ generation. Furthermore, the Hmong American community pointed to an increasing number of political leaders, male and female, who assist in creating policies and programs that are aimed at improving the overall well-being of the community. Others also mentioned the large number of businesses and institutions created to serve members of the Hmong community. Such factors have created a positive perception of the how the Hmong community is faring in the eyes of its members. Many Hmong Americans state that their most important community assets include their strong family foundation, clan network and their value of having a good education. Some of the barriers to better health and wellbeing for the Hmong community are high rates of unemployment and poverty, limited English ability and unaffordable medical costs. Over 12 percent of the Hmong community reported that they were uninsured.1 Hmong community members who participated in the project indicated that uninsured members at times seek medical care from Shamans to alleviate their physical and mental health issues (See side bar). Hmong American families also use herbal remedies and may conduct healing ceremonies in the hospital and in the home. In addition, community members indicated that surgery and organ donation may not be acceptable as treatment for medical ailments and some members of the Hmong community believe that certain Western medicines may poison them, rather than help them. While Hmong community members value physical activity, especially low-impact exercises such as gardening and walking, many Hmong community members identified the traditional diets as a health issue that needed to be addressed in the community. Hmong Americans have among the highest obesity rates in comparison to other AAPI ethnic groups (Figure 3). White rice and fatty meats are considered a staple for many Hmong families while vegetables are often cooked with the meats and not eaten raw. “Hmong people, in general, don’t know what food is nutritional and what is good for the body, but through word of mouth, more people are learning about it,” said a Hmong community member during his key informant interview. 1 Council of Asian-Pacific Minnesotans (CAPMN). 2012. 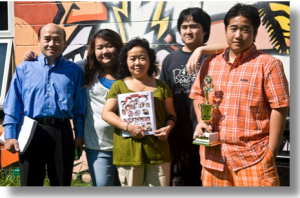 The State of Asian Pacific Minnesotans: 2010 Census and 2008-2010 American Community Survey Report. St. Paul, MN. 2 Pierce PhD, Alexandra. 2010. Health Disparities in Southeast Asian and African Refugee Communities. Produced for the CAPI – Center for Asian and Pacific Islanders. Minneapolis, MN. Guest P. Vang: Yes. A few have medical insurance. However, there are others who do not have medical insurance due to unemployment or is not eligible to apply for medical insurance through the state. Host Yang: Without getting access to medical coverage, is there anything else to help you with your health, or are you still looking for resources to help you with this area? Guest P. Vang: Yes, we do need help. There are those who are in severe pain and in critical conditions who don’t get access to healthcare and don’t get treated due to the lack of medical coverage. Therefore, the only alternative our Hmong communities fall back on is to perform cultural practices; such as performing spiritual activities from a Shaman. Plus, if evil spirits is the cause of the person’s sickness, then “spirit calling/healing” from a Shaman would work. However, if the cause of the sickness is due to diseases, then it is necessary to seek a physician and be hospitalized.